In the almost complete absence of any direct reporting from the border area it is difficult to be sure about what exactly happened in the area of the Kagera Salient in West Lake Region. The following is a brief account of some important dates. 12th October: The Ugandan Government claimed that a battalion of Tanzanian troops crossed into Uganda and that there had been fighting near Mbarara. There was an immediate denial from Tanzania. A Tanzanian spokesman said that allegations of invasions were always made when Uganda was facing internal trouble. No evidence of a Tanzanian invasion at this time was ever produced by the Ugandans. But it was later revealed that on or around 13th October Ugandan aircraft bombed villages and roads around Bukoba. The Tanzanian Government apparently tried to play down the incidents for fear that they would distract attention from southern Africa. 22nd October: Idi Amin announced that the Tanzanian “invading force” had pulled back. 26th and 28th October: Ugandan aircraft again bombed Bukoba. 27th October: Again, Uganda claimed it had been invaded by Tanzanian forces, this time Cuban troops were alleged to be involved. Again, reports were dismissed by the Tanzanian Government and by most independent observers and diplomatic sources. 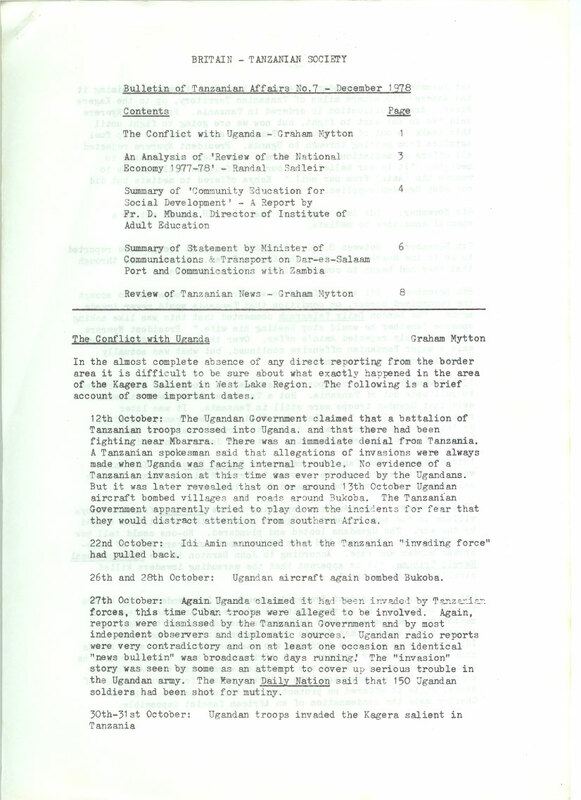 Ugandan radio reports were very contradictory and on at least one occasion an identical “news bulletin” was broadcast two days running: The “invasion” story was seen by some as an attempt to cover up serious trouble in the Ugandan army. The Kenyan Daily Nation said that 150 Ugandan soldiers had been shot for mutiny. 1st November: The Ugandan government issued a statement claiming it had annexed 710 square miles of Tanzanian Territory, up to the Kagera River. Army mobilisation is ordered in Tanzania. President Nyerere said “We do not want to fight, but now we are going to fight until this snake is out of our house.” Tanzania asked Kenya to stop fuel supplies from getting through to Uganda. President Nyerere rejected all offers of mediation, saying firmly that there was nothing to mediate. “It is our belief that our true friends will want us to remove him (Amin) from our soil.” Kenya offered to mediate but did not stop Ugandan supplies. 6th November: Idi Amin suggested that the OAU should set up a special committee to mediate. 7th November: Between 8,000 and 10,000 Tanzanian troops were reported to be in the Bukoba area near the Kagera River. Reports came through that they had begun to counter attack Ugandan positions. 8th November: Idi Amin offered to withdraw his troops and to accept the recognised border, on condition that Tanzania would never invade again. The London Daily Telegraph commented that this was like asking someone “whether he would stop beating his wife.” President Nyerere contemptuously rejected Amin’s offer. Over the next few days reports said a major Tanzanian offensive continued, but what was actually happening could not be confirmed. 13th November: It was reported that Ugandan troops had been ordered to pull back out of Tanzania. But a Tanzanian Government statement said that Ugandan troops were still in Tanzania. It was later revealed that 40,000 Tanzanians had fled from the Ugandan invaders. 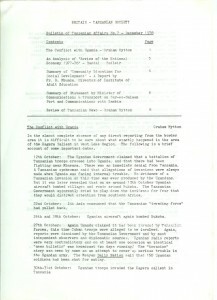 By 16th or 17th November most diplomatic sources believed that all Ugandan forces had left Tanzania. But some doubts remained. 19th November: The Tanzanian newspaper Sunday News said Idi Amin was “a cancer which must be removed.” Prime Minister Edward Sokoine said Tanzanians should be prepared for a long war. 9th December: President Nyerere’s speech on Independence Day refers to the conflict. He is very critical of the OAU and its attempts at mediation. He demanded that OAU states should condemn the Ugandan invasion and ensure that Uganda paid compensation for the damage. Idi Amin, he said, was a murderer who was responsible for more deaths than either Smith or Vorster. But Africans had been silent because he was black not white. There was something wrong with the OAU Charter which made the organisation into a “trade union” for African heads of state, while it offered no protection to African people. The OAU Charter made the condemnation of an African fascist impossible. to Kenya and Uganda and a 73.5% fall in imports from those countries. The tourist trade was particularly hard hit with a decline in the overall number of visitors, and a 39.6% reduction in hotel bed occupancy rates – the Northern areas being most affected with only 11% of tourist hotel beds occupied. The cholera epidemic did not help. The communications and transport systems suffered most from the collapse of the Community which has left Lake Victoria with no ship, the Indian Ocean ports especially Dar-es-Salaam with a critical shortage of dock facilities unloading equipment and storage space, and the infant Tanzania Airways Corporation short of vital aircraft and spare parts. However, the authors remain optimistic, pointing out that the state of the economy as a whole showed some improvement in that the National Income had increased by 5.9% as against 5.2% the previous year, whilst the food position had also improved although it had again been necessary to import over £11 million worth of grain (mainly rice, maize and wheat) and this accounted for 5.3% of the imports bill. High world prices of cotton, coffee and cashew nuts helped to swell the agricultural sector by 5.6%, (the rise had been 4.7% in the previous year) whilst other sectors of the economy to show increases included water and power, wholesale and retail trade and minerals. Low industrial output again caused concern and was as usual attributed to shortage of experts and raw materials, increased costs of building materials, power cuts, water shortages, and difficulties in identifying suitable overseas markets. The communications, transport storage and building sectors also proved disappointing. The 1976/77 improvement in the balance of payments was not maintained, a 10% increase in exports being offset by a 14.3% increase in imports, to leave the trade deficit widening again from £65 million to £83 million. Inevitably inflation was still a problem with rising prices largely caused by increases in the cost of food, cigarettes, paraffin oil, transport and accommodation (the rent of a room increased from 30/- to 50/- per month in May 1977). The retail price index for middle income workers in Dar-es-Salaam increased by 20.6% in 1977, compared with 8.4% increase in 1976; the same index for lower paid workers in Dar-es-Salaam went up by 16.9% in 1977 as against 14% in 1976, whilst the index in Dodoma only went up by 7.3% in the year under review. The number of paid workers rose by 3.8% from 456,787 in 1976 to 474,090 in 1977, virtually restoring the position to the 1975 level of employment. At the same time the total wage bill rose by 20.4% compared to the 2.2% drop the previous year; this was largely caused by increased employment in the agricultural sector. As usual the report is well furnished with 70 tables of statistics conveniently placed in relation to the subject material, from which a vast amount of information can be gleaned by the reader, ranging from the customary fiscal figures to interesting items such as the electricity consumption in Mafia, the 122 tons of mail carried by air in 1977 and the million passengers who travelled on the UHURU Railway during the same year. Its pages well illustrate the tremendous struggle facing a new nation swimming against the economic tides, but buoyed up with a fierce determination to stick to her political principles at all costs. by Fr. D. Mbunda , Director Institute of Adult Education, Dar-es-Salaam. Chiwanda ward is on the shores of Lake Nyasa in Ruvuma region, its five villages have a total population of about 8,000. The area has a high level of literacy but health care facilities are poor and communications both by road and lake are difficult and irregular. Economically the Lake shore is very poor and people depend largely on agriculture and fishing. There is no cash crop and traditiona11y the young men have left to earn money by working in other countries. The main food crop is cassava with small amounts of maize and rice, all farming is done with the hand hoe. The supply of fish from the lake is unreliable and rarely adequate. As a result of their poor diet the Wanyasa people who live by the Lake suffer from malnutrition and consequently have little energy to experiment with new ideas. The difficulties in initiating developments in Chiwanda have been demonstrated over the years by the repeated failures of Government sponsored projects. “The Chimate people were given financial and material support to start an Ujamaa village. Two donkeys for drawing ploughs were bought for the villages. The village also were given cows for milk. The donkeys died of neglect and ignorance; the cows were slaughtered by the villagers on a festival! The ploughs remained idle. Despite the relatively high level of literacy achieved by formal schooling education had not provided the necessary dynamic for social and economic change until the mass radio learning campaigns ‘Man is Health’ (1973) and ‘Food is Life’ (1975). Through listening groups organised by the Institute of Adult Education people in Chiwanda began to recognise malnutrition as their problem and to discuss ways in which it could be remedied. Since the radio campaign had been organised by the Institute of Adult Education it was natural that its local President Tutor should be asked to help put the campaign’s ideas into practice. In the light of the history of failures it was considered essential that any project should be fully acceptable to the local people and in order to achieve this they had to be involved at every stage of the planning. The first step was the creation of a planning team consisting of local leaders and representatives and extension service officers. … the Team would be introduced to simple skills in techniques of project formulation, implementation and evaluation. … the key members in the five villages learnt about simple ways of problem identification, conducting feasibility study, project design, monitoring and evaluation. 1) Fruit growing – each village to have a 2-acre communal plot and each Household two orange trees. 2) Vegetables – a 1-acre plot per village plus individual holdings. 3) Poultry – a single unit for the ward as an experiment. These developments were to be backed up by a programme of training in new techniques of production, preparation and preservation of food. The plan was put to a meeting of all village council members and 10 house cell leaders, after three days of discussion the project was accepted. With the people committed to working for the improvements the I.A.E. was able to seek funds to purchase the materials which were not available locally. S.I.D.A. (the Swedish International Agency for Development) offered sh.44,OOO/- and UNESCO sh 21.000/-. This money was used for seeds, young trees, insecticide, chicks, wire and nails. Assessing the achievements of the project by mid 1978 the Institute of Adult Education found that the poultry unit had earned sh.10.000/- and egg consumption had become accepted to the extent that each village wanted to have its own unit. All of the villages were beginning to harvest pineapples and vegetables such as tomatoes; spinach and cabbage were being regularly planted and eaten. However F. Mbunda emphasises that this is the first project of its kind undertaken by the Institute and that more examples are required before arriving at firm conclusions. statement by the Tanzanian Minister of Communications and Transport, Hr. Amir Jamal. This is a shortened version of a statement issued by the Tanzanian Government in reply to Press allegations on the inefficiency of Dar-es-Salaam Port and Tanzania’s capacity to transport goods, in particular fertilizer, to Zambia. “In November 1965 the only link between Dar-es-Salaam Port and Zambia was a dirt road. When Zambia decided to participate in the world sanctions against Rhodesia, all its oil, a large proportion of its copper, and many of its other goods were transported on this road, which was rapidly destroyed. Tanzania and Zambia took immediate and combined steps to deal with this situation. By 1973, when Zambia closed its border with Rhodesia, there was in existence: a jointly owned Oil Pipe Line (2/3rds pwned by Zambia, 1/3rd by Tanzania); a road Transport Company jointly ovmed by Zambia, ‘L’anzania and an Italian firm; and tarmac on a realigned and re-designed road from Dar-es-Salaam to Zambia. This work was completed in 1969. By the beginning of 1978, the road existed and – most important of all – the jointly-owned (50% owned by Zambia and 50% by Tanzania) Tazara Railway from Dar-es-Salaam to New Kapiri Mposhi had been in operation for almost two years. In 1965, there were three deep water berths in Dar-es-Salaam. By 1973, there were eight such berths. By the beginning of 1978 there were eleven berths in operation. Construction of two more berths is under consideration. All these figures exclude berths which require unloading by lighters. Tanzania Harbours Authority is a parastatal corporation, which under the law which established it, is required to run its affairs on commercial principles, and earn adequate savings to meet the needs of steady expansion. Rates, once fixed, normally apply to all users. There is no case where non-Tanzania users pay higher rates than Tanzanians. Congestion of the port of Dar-es-Salaam has at different times been a problem. This has been caused in part by “bunching” of ships,by the nature of the cargo such as bulk cargo or general cargo, by the bringing in of very smal1 consignments which nonetheless require full in-and-out treatment. The primary cause has been the failure on the part of importers to move their goods from the port area; in particular importers of Zambian goods have taken considerable time in clearing their goods. The situation has been aggravated by the practice of Zambian copper exporters to accumulate different quantities of copper at the port, sometimes to meet particular sales contracts, at other times to accumulate in anticipation of sale, so that there could be at any time large quantities of copper, up to 70,000 tons awaiting shipment and yet a quantity of each consignment may still remain to be railed from Zambia or for which sales remain to be concluded. Recent reorganisation in the port has begun to show positive results. For example, the average waiting time for unitized ships is now four days. For conventional cargo it is 16 days. While the new system needs a period of consolidation, it still remains dependent upon movement of goods out of the port area. TAZARA was constructed with a view to eventually being able to transport 5M. tons of cargo in both directions. The initial rolling stock and locomotive power was intended to ferry 2M. tons in both directions. This equipment consists of 85 main line locomotives and 2,100 wagons. (These figures presumably are per year although the statement does not specify this). On 7.10.78 (latest available information) out of a total of 1,484 wagons in service, 498 wagons were in Tanzania and 986 were in Zambia. The current turn-round time is about 20 days. In the third quarter of 1977 it was about 10 days. TAZARA wagons are the same gauge as Zambian Railways, and different from the Tanzanian Railways Corporation. In 1977/78, 419,943 tons of goods were railed to Zambia from Dar-es-Salaam by TAZARA – an average of 1,150 tons per day. So far in 1978, an average of 700 tons per day has been moved. There seems to be a continuing deterioration of the situation judging from the fact that in September this year the average has fallen to 420 tons per day whereas some 9,000 tons of documented imports destined for Zambia are awaiting transportation. In 1977, 117,420 tons of goods were transported to Zambia from Dar-es- Salaam by road – an average of 322 tons per day. So far in 1978, an average of 308 tons per day has been transported. Tanzania was first informed of the Zambian problem about fertilizer on 4th October 1978, when the UNIP Secretary-General Chana saw President Nyerere to inform him of the necessity for Zambia to move goods through Rhodesia. In an endeavour to make this unnecessary, the President immediately instructed that top priority should be given to Zambian fertilizer. After investigation, the President was informed that there was no Zambia fertilizer in Dar-es-Salaam or elsewhere in Tanzania waiting to be transported to Zambia. Relations with Zambia have been somewhat strained by three main factors, the railway and port facilities, Rhodesia and the expulsion of Tanzanians from Zambia. The re-opening of Zambia’s borders with Rhodesia in October followed difficulties with both the TAZARA railway and congestion in Dar-es-Salaam – at least according to Zambian sources. The Tanzanian view is that the action was not necessary and that the Tanzanians had heard of the fertiliser shortage for the first time only a day and a half before the re-opening. Evidence of such progress was provided by talks on trade in December. No details have been produced but an inter-government committee is proposed. The continuing troubles with TAZARA are referred to above. In a move to solve the congestion problem at Dar-es-Salaam, the executive Chairman of the Tanzania Ports Authority. Mr. Peter Kisumo, announced that Sh 1,500 million would be spent over the next five years on development equipment and training. A training institution will be established. The Tanzania Ports Authority was inaugurated in October and replaces the former East African Harbours Corporation. The ambitious and extensive modernisation of the entire old railway system is now underway. This was reported in earlier bulletins. British Rail is exporting £24 million worth of equipment to Tanzania. The contract is for 510 wagons and 50 passenger coaches. The wagons are being produced as “kits” in Ashford in Kent, and are then assembled in Tanzania. Lloyds Bank is providing a loan to the Tanzanian Railway Corporation for a large part of the purchase. British Rail’s order was also helped by a £4 million Overseas Aid grant and credits guaranteed by the British Government. Finland will finance and organise the training of 15 Tanzanian pilots and 12 flight mechanics for the new airline. A satellite communication station is being bought from Japan to end the country’s dependence on Kenya for external telecommunications services. It should be completed next year and will cost Sh 23 million. At present BO% of international telephone calls and 90% of international telex calls are routed through Nairobi and the Longonot earth satellite station. An inter-nation telex exchange was purchased in 1978 at a cost of Sh 9 million and was expected to become operational by the end of the year. It is however agreed that TAZARA is facing severe problems. Ministers from Zambia, Tanzania and China reached agreement in August on improving its operation. It was also agreed that 800 Chinese technicians and instructors would stay on an additional two years to help run the railway. Observers have blamed the lack of sufficient maintenance, derailments, thefts and indiscipline for the railway’s troubles. The Tanzanian Minister for Transport and Communications Mr. Amir Jamal denied Zambian allegations that the port facilities at Dar-es-Salaam were to blame for long delays on Zambian cargo. He blamed the inefficiency of the railway and congestion caused in the port by the behaviour of Zambian shippers. About 1,500 Tanzanians have been expelled from Zambia since August. They were, according to the Zambian authorities, unregistered and therefore living in Zambia illegally. Zambia took similar action against citizens of Zaire, Malawi and Somalia. The border has remained closed and travellers between the two countries have had to use long and expensive routes via Mauritius, Burundi, Zaire or elsewhere. In June Foreign Minister Ben Mkapa told Parliament that the border would be re-opened when all nine conditions agreed at the Mombasa talks in December 1977 were fulfilled. He said that up to date two conditions had been fulfilled, the release by Kenya of the three ships at Kisumu and the release of Kenyan property by Tanzania. President Nyerere attended the funeral of Mzee Jomo Kenyatta in August and called on President Daniel Arap Moi. He said that progress on restoring links was being made. In June it was announced that the UK will spend nearly £3 million on helping development in Lindi and Mtwara. The money will be spent in sending out seventeen British agricultural and livestock specialists to assist in formulation integrated development attracted to these regions. In July Mrs. Judith Hart the Overseas Aid Minister, announced that Britain was cancelling debts totalling £900 million owed by 17 developing countries. Loans would be converted into grants. More than half this sum was owed by India. Tanzania is among the other affected countries. A group of Conservative M.P’s tried to oppose all aid to Tanzania and other front-line states. In spite of this, British aid to Tanzania has been substantially increased this year. The allocation for 1978 is over £6 million. Tanzania refused to join Nigeria in its boycott of the Commonwealth Games in Edmonton, Canada. For Tanzania, Filbert Bayi was beaten into second place in the 1500 metres by David Moorcroft of England. The only gold medal won by a Tanzanian was in the marathon, it was not won by the East and Central African marathon champion Emmanuel Ndiemandoi, but by the little-known Gidamus Shahanga. Shahanga was very nearly dropped from the Tanzanian team. He is 21 years old from Jaradom in Hanang District. He is still a secondary pupil in Dodoma. Shahanga’s ambition now is of course to win the marathon in Moscow in 1980. The Minister for Culture and Youth, Mr. Chediel Mgonja, went on a month-long tour of five western and eastern countries to seek aid for the development of sport. He said his trip had been successful and that governments were interested in helping Tanzania promote sport. Tanzania has taken over all Lonrho property in the country. In June the British company had been given three months to negotiate the takeover. But, said Sammy Mdee, “it had become clear the Lonrho was refusing to negotiate.” Tanzania also claimed that Lonrho had overvalued its assets. Lonrho denied these charges and said that it would take legal steps to prevent the Tanzanian action. In September the Ministry of Water, Energy and Minerals announced that geological studies had indicated the presence of deposits of uranium in the country. The Tanzania Coffee Authority announced in October it will spend Sh 50 million this year on aid for small-scale coffee growers. It was said that this represented a change in policy from helping only the large-scale estates. Sh 3.5 million worth of wheat was destroyed by millions of quelea birds. The quelea “occupied” the NAFCO farm in Western Kilimanjaro in July and August. The damage represented 70% of the total expected national wheat yield. The birds also caused extensive damage to other crops in the region. A NAFCO spokesman said that it had been able to do nothing because it had no spraying plane. Later it was announced that two such planes had been purchased. The Minister of Agriculture, John Malecela, announced that the Government was discussing with FAO the establishment of special centres to deal with crop destroying birds. There was a serious (1 million kg) fall in tobacco production in Iringa in the past season. It was caused by heavy rain, poor attendance on communal farms and an outbreak of cholera which prevented movement during quarantine. Generally, however, tobacco production is a success story. In 10 years it has increased by 225% in Mbeya. A census was carried out in August, the first since 1967. Twenty thousand enumerators visited all parts of the country. The ban on game hunting was lifted in July for a six month period. Permits to hunt were granted for 260 safaris by big game hunters. The ban was lifted because of the need to cull some wildlife, which has shown a considerable increase because of conservation measures. The Tanzanian Tourist Corporation says that in future, tourists would be able to visit Ujamaa villages, factories, and farms. An experiment had been introduced covering four regions. Fourteen members of the Barbaig raiding party were sentenced to death for the murder of 21 villagers in Iramba in 1976. A number of Tanzanian officials resigned after allegations of brutality during the questioning of suspects. The Comptroller and Auditor General has once again produced a critical report. This time it says that some Sh 15 million in cash and goods were embezzled from the Government last year. The report presented to Parliament blamed slack financial control.